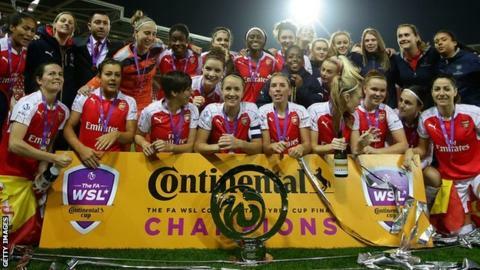 Women's Super League leaders Manchester City Women will host holders Arsenal in the semi-finals of the Continental Cup. Arsenal beat Notts County in the last eight on Friday, the same side they overcame in last year's final. Manchester City, who are seven points clear at the top of WSL 1, thrashed Doncaster Belles 4-1 on Sunday. WSL 2 side London Bees will face Birmingham City in the other semi-final, with both ties to be played on the weekend of the 3-4 September.